The Americans have had a taste of their own surveillance medicine after a private diplomatic phonecall was leaked yesterday. The phonecall included the phrase ‘F**k the EU’ from a senior American diplomat and detailed US meddling in Ukraine at length. 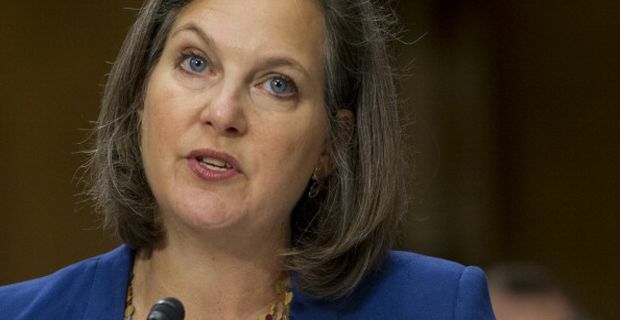 Perhaps the most eye-catching aspect of this story is the expression of frustration by Assistant Secretary of State Victoria Nuland when she despaired of the European Union’s mildly non committal strategy over Ukraine and blurted out "And you know, f--k the EU." Eyebrows immediately shot up in global capitals, and while diplomats and politicians in Europe stayed discreetly silent, the press have been giddy with glee. And yet who hasn’t used expressions like that in a private context. It seems disingenuous to try and turn this into a transatlantic rift, and to her credit, Ms Nuland has responded to her expletives being leaked with a certain twinkle. But far more important is the way in which the telephone call reveals the extent of US involvement in the Ukraine. The Ukranian opposition begin to look much like American puppets within the context of this call and the Americans clearly have an array of irons in the Ukranian fire. The conversation seems to have taken place after Ukrainian President Viktor Yanukovych's Jan. 25 offer to opposition leader Arseniy Yatseniuk to be prime minister and former pro boxer Vitali Klitschko, to be deputy prime minister. It includes very undiplomatic assertions about who should do what and the implication that pressure will be applied. Meanwhile the Americans were incandescent with anger at their diplomats not only having been recorded, but the Russians then publicising that recording. "This is a new low in Russian tradecraft," Secretary of State spokesperson Jen Psaki said as White House press secretary Jay Carney did everything he could to suggest Russian espionage and leaking without actually saying the words. Indeed the Russians do seem to have leaked this rather brazenly in what seems like a clumsy attempt to drive a wedge between the EU and the US.